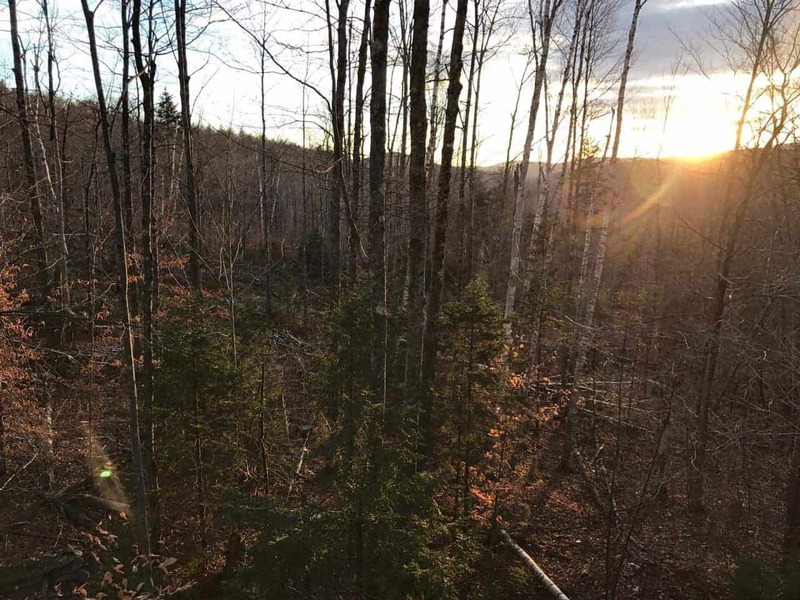 4PT16.13 – Vermont Opening Day of Rifle Season - the4pointer.com | Real Hunts. Unreal Stories. The only luck I had on Saturday was bad luck. Oh well. It happens. The morning started off well enough, but then I put on my underwear. Unbeknownst to me, I put it on inside out, which set the tone for the rest of the day. If I had caught this mistake earlier, perhaps the day would have panned out differently. Tagging along for the day was a young man who didn’t have much, if any, experience deer hunting. Naturally, we put him in the stand that was easiest to get to and also one of the best. Predictably, I heard him shoot a little after seven. According to him, the deer “had a big neck and a nice rack of horns.” Thanks to a case of buck fever, he missed. Twice. I decided to give him a hand verifying the miss and left my makeshift stand located on the edge of a recent logging cut. It was only seven, but I was already fed up with my spot. I had spooked a deer in the dark just before taking a seat. Even though it was still twenty minutes before legal light, I could easily make out the form of a large deer and watched as it bounded away. It blew at me too, just to pile on the frustration. The lungs capacity was large and the footprints heavy as it trotted away in the dim light of morning. Argh! So, after tramping around in the leaves looking for a sign of a hit on the deer that “had a large neck and nice rack of horns”, I decided to hunt a new area where I’ve had success calling in a few deer in the past. I haven’t had any success shooting them, just calling them in. This particular spot is located on the backside of a high ridge. The only way I know how to get there is to approach it from the top and descend 300 yards down an extremely steep hillside. The hillside is forested with hemlocks and the base of it gives way to a semi open hardwoods with old, half grown in logging roads that run parallel to the hillside. Deer like to use the logging roads to travel and there are frequently rubs and scrapes present. The wind was blowing straight up the hill while I descended. It was perfect. That is, until the time I blew on my grunt call. I’m telling you right now that if you have ever blown on a grunt call and had a buck respond you know the excitement that comes with it. Sure enough, no sooner had a finished a little calling sequence I heard a deer trotting in. My rifle was up and ready. No doubt it was the big one coming in hot. Then the wind shifted. Argh!!!! Instead of blowing straight up the hill as it had been all morning, it swirled and blew straight in the direction of the approaching stud. I never saw him. He got hung up just out of sight, which was probably not more than sixty yards away. My spirit sank as I heard him bound away in the dry leaves, blowing at me as he went. I saw pictures of some real nice bucks posted on Facebook over the weekend. Congrats to all the successful hunters!